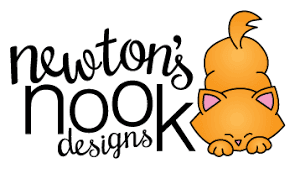 Today I am excited to share with you that Newton`s Nook Designs is both our guest and sponsor! 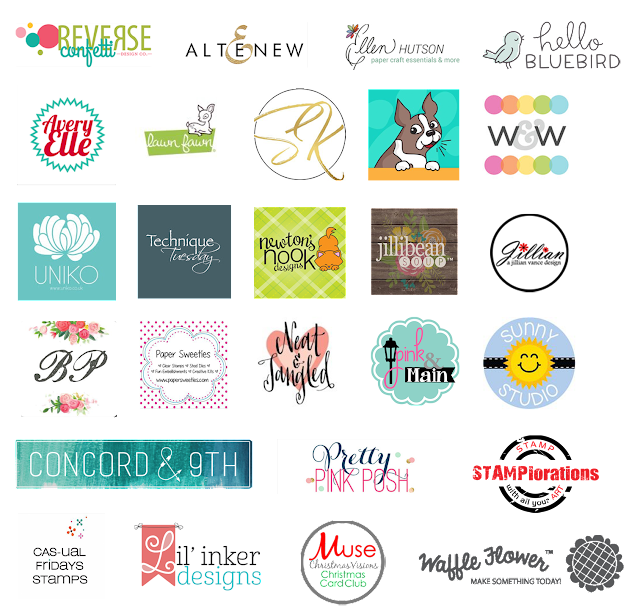 They have a $25 gift certificate for one lucky winner! ...and one from me along with a video! Wow wow wow!! These are all wonderful!!!!!!!!!!! So many super cute scenes today, and I love those bauble shakers! SQUEAL!! LOVE ALL of the AMAZING Inspiration!! NND has my HEART!! SO EXCITED to be a part of this FUN Event again this Year!! 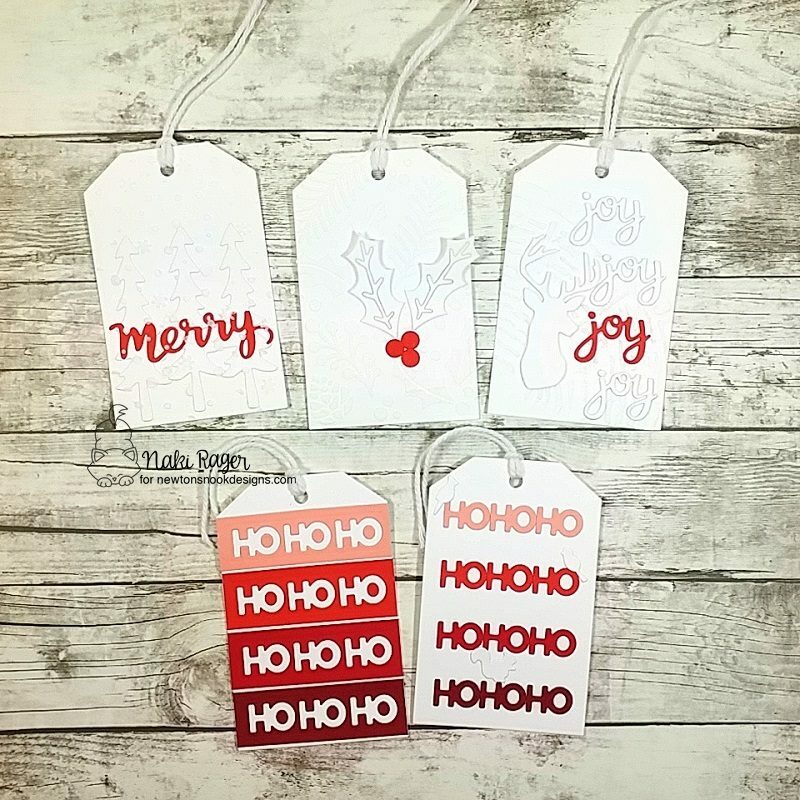 I'm still in SHOCK that its time for Holiday Tags though!! Where did 2018 go!!?? THANKS SO MUCH for Hosting this Event again this Year and I hope you have a FABULOUS WEEK!! 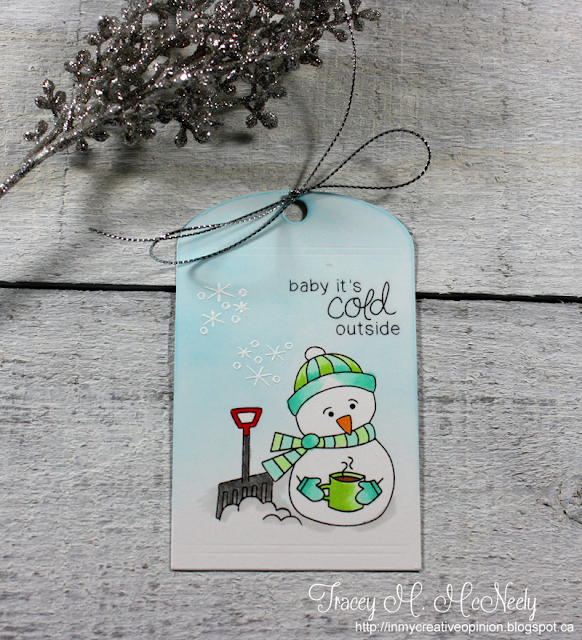 Your tag is so sweet Tracey I love a one layer scene built up by masking, it is really something I must do more of. TFS! WOW! I absolutely adore every tag showcased today; inspired and inspiring! Christmas spirit soaring in seeing these festive delights! Your little snowman, taking a well-deserved break from shoveling, is adorable! He's certainly earned his hot cup of coffee/cocoa (and would certainly need it here, where we're having a frosty -12C morning!). Such amazing tags and inspiration! Just darling tags. I love the shaker tags! Thanks for the inspiration! 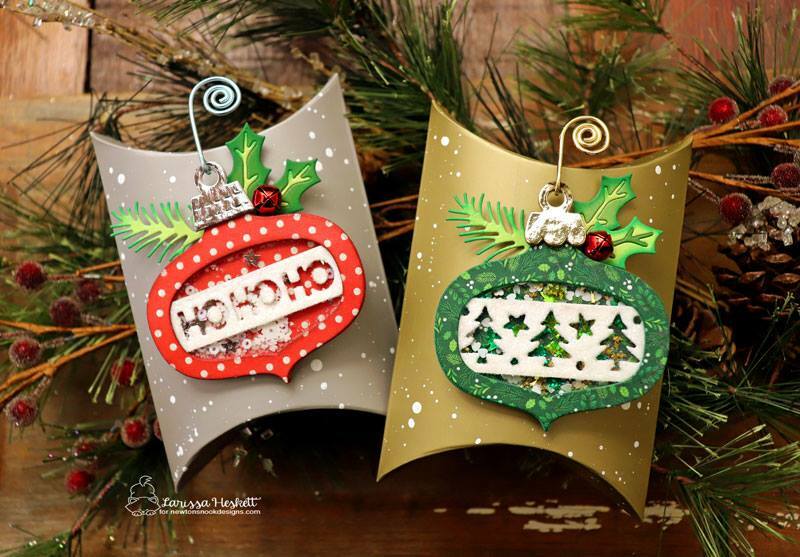 Love those ornament dies! Such great shaker cards. OMG, I so enjoyed all of the tags today!!!! Newton's Nook has some of the cutest animal and character stamps - very sweet. I love your cozy little snowman! SO MUCH CUTENESS! I love all the dog ones! Great coloring!!! Adorable tag! The shaker ornament is awesome. 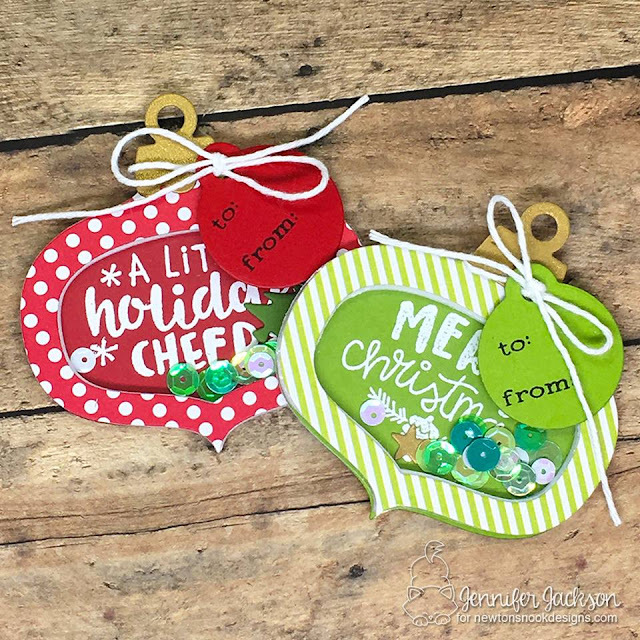 How fun to make ornament shaped tags. So many cut and fun tags today. Thanks. I love all of these adorable tags from newton's Nook! That little kitty , and the hot cocoa dies are SO CUTE! Tracey, your tags look amazing too! I love this little snowman holding his cocoa! Tracey...your snowman is just so cute! Love your sweet tag. These are the sweetest tags ever!!! So many cute animals and super fun shakers!!! 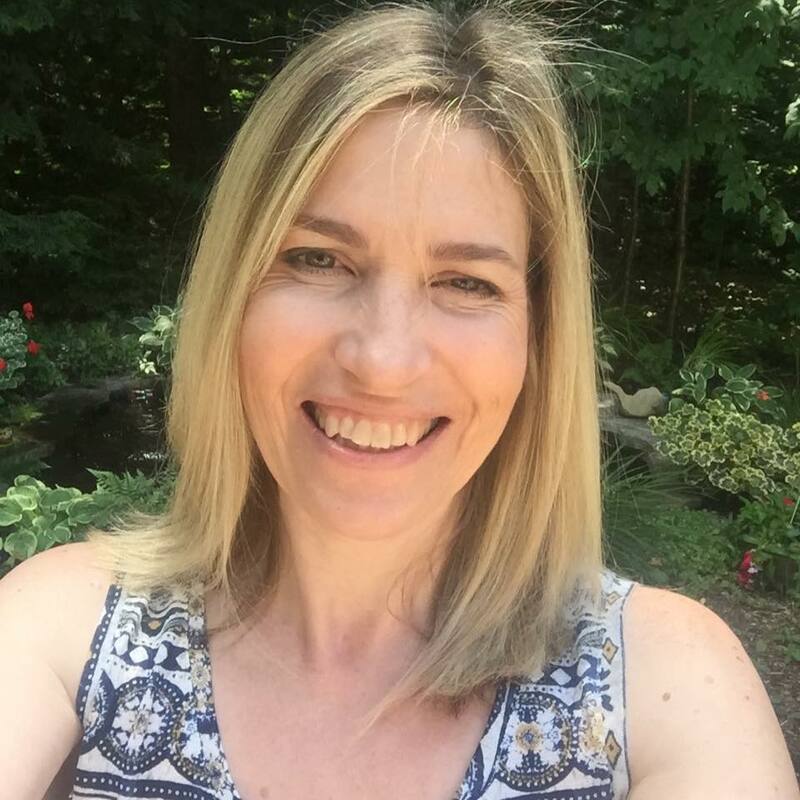 Thanks so much for sharing and inspiring!!! Fabulous tags! I am really loving those shaker ornaments! Love that adorable snowman you used also! Delightful! I am inspired by several tags to day! Another great pairing with Newton's Nook. Newton's Nook certainly knows how to do cute! Love their kitty designs. I adore your tag today, Tracey! The snowman is so sweet. 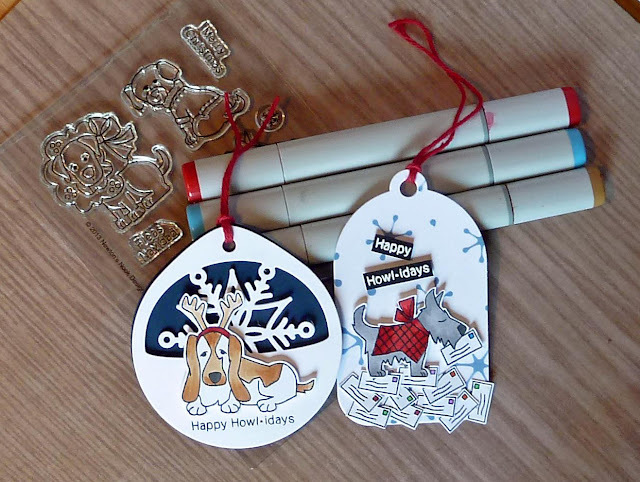 It reminded me that I've got an adorable snowman wooden stamp that I'd forgotten about. He's definitely going to be the star of some of my Christmas tags now. Thanks for the inspiration! These all just make me smile! Your little snowman is adorable Tracey, I like the soft background! Lovely, as always! 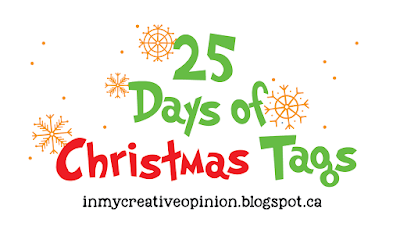 I'm really into the quick and easy this year so I was inspired by Tatiana Trafimovich and Naki Rager especially. Thanks for sharing everyone! I'm a huge sucker for cuteness, so Newton's Nook always gets my attention. The team didn't disappoint, either. 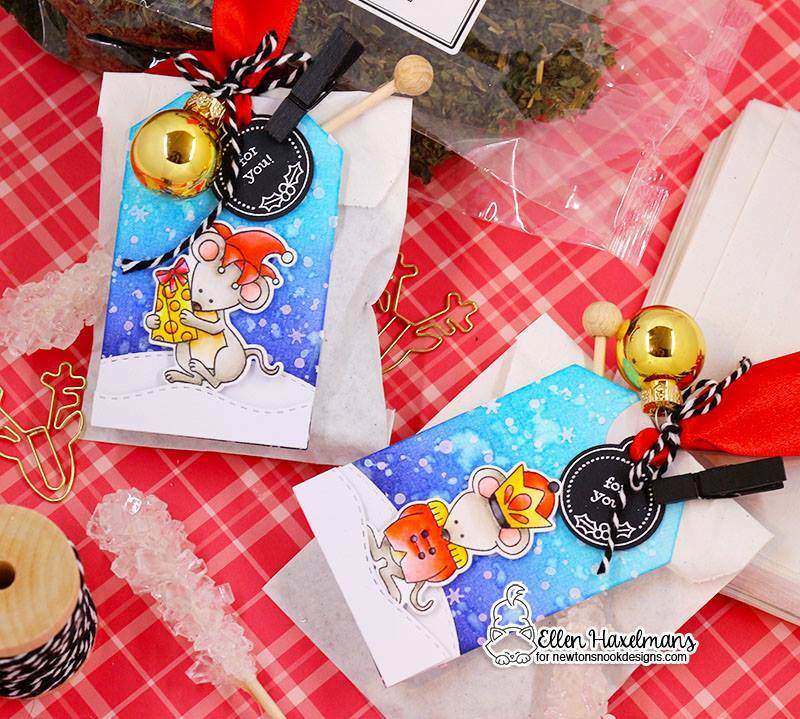 Cuteness everywhere, for those fab shaker tags to the adorable cat. Oh my goodness! I can't even pick a fave- too many I love! I'm not even sure I can pick which one to CASE!!! Thanks for the inspiration! loving all these darling tags!!! Stellar tag today,, Tracey. Can't wait to watch the video to see how you worked your magic. Beautiful tags can’t pick a favorite! Super adorable!! The hot cocoa ones really stole my heart!! These are all so fun and adorable! the hot cocoa tags are super cute! Your tags are amazing, and you always inspire me with your creativity. I am anxious to try all these fabulous ideas. Thanks so much for sharing. I look forward to each day. So many darling tags today! 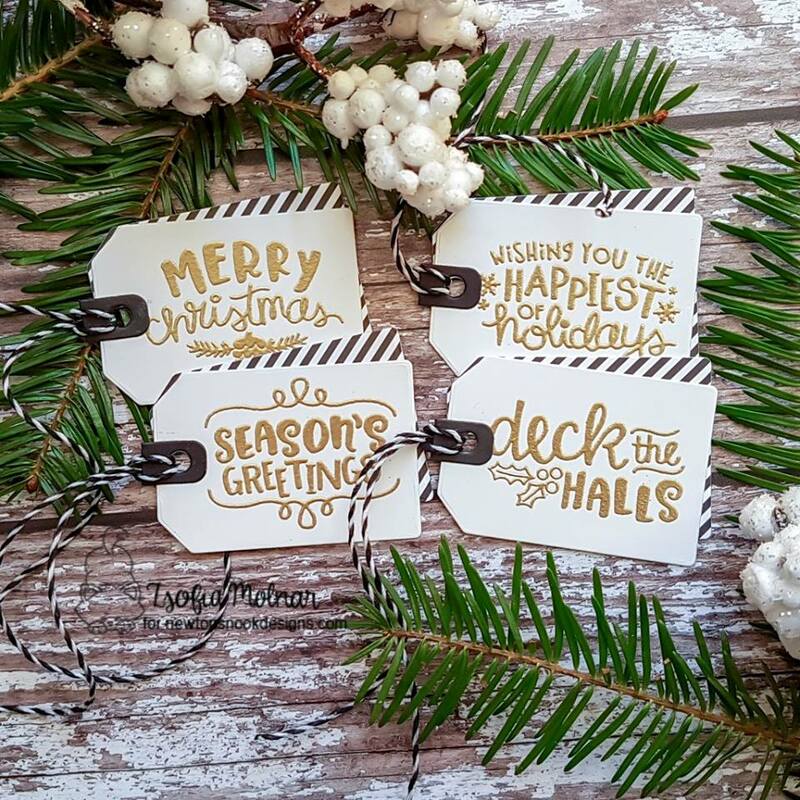 I love all the ornaments & animals, but I'm really drawn to the gold, black & white tags with the sentiments as the focal points! So gorgeous!! I have some of these Newton's Nook goodies, thanks for inspiring me to create! Oh what a sweet and happy tag Tracey! Adorable! What beautif tags. I love Newtons Nook stamps. I am a cat lover and have bought or the Newton stamps. You have given me inspiration to try make some tags with them. Wow! I love Newton's stamps. He's so sweet!!! All these tags are adorable! I was inspired by the gorgeous shaker ornament tags! I think I'll make a lot this year to decorate my Xmas tree!!! Beautiful tags! You are going to be my muse. Cute tag ideas! I really like the fun ornaments and the hot cocoa tag. Oh my! What's not to love about Newton's Nook? I adore all they're stamps. Cute, cute inspiration all around!! These are all fantastic tags! 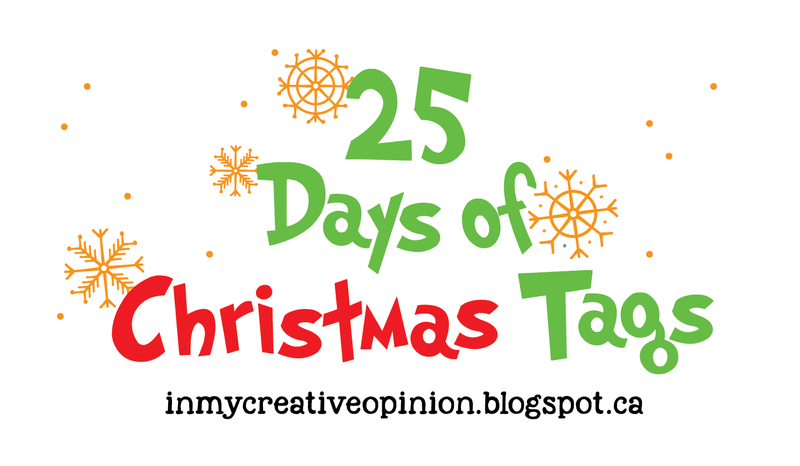 I'm still working on Christmas cards, but I can see some cross-overs here with great ideas! 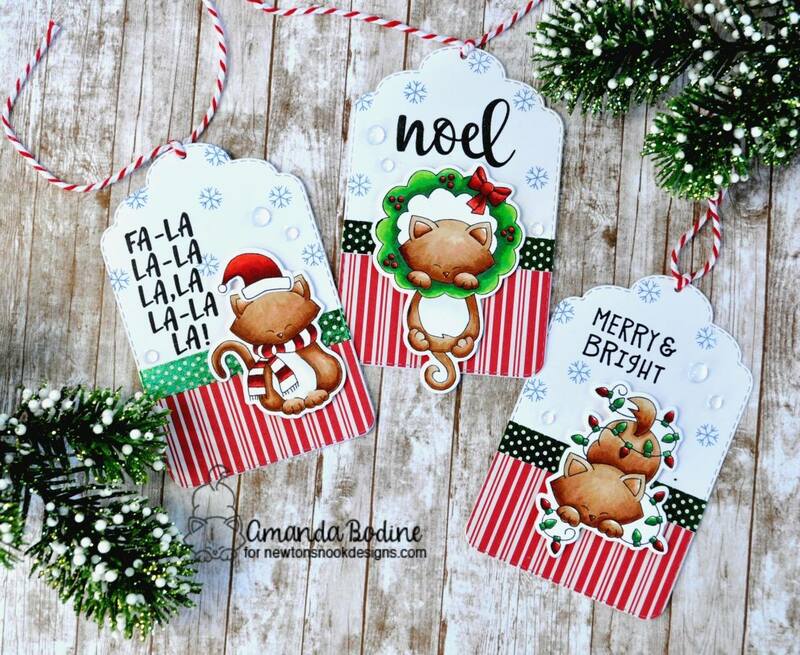 Newton's Nook has some really cute designs and of course these fun and festive tags reflect that. So many cute images and amazing tags! Your little snowman is adorable! I love all the bright colors! So many cute ones! Yours has such perfect blending, you can’t tell where one color leaves off and the other starts! oh boy, these are all so very inspirational! Such a fan of Newton's Nook Designs. I love Newtons Nook... the cats and the little mugs people used are sooo cute! Wonderful tags and great inspiration. Great ideas all around! I think my next may be a shaker card??? All these tags are super cute. I have not heard of the company before. Great work. Wonderful shaker tags!! Very festive!! 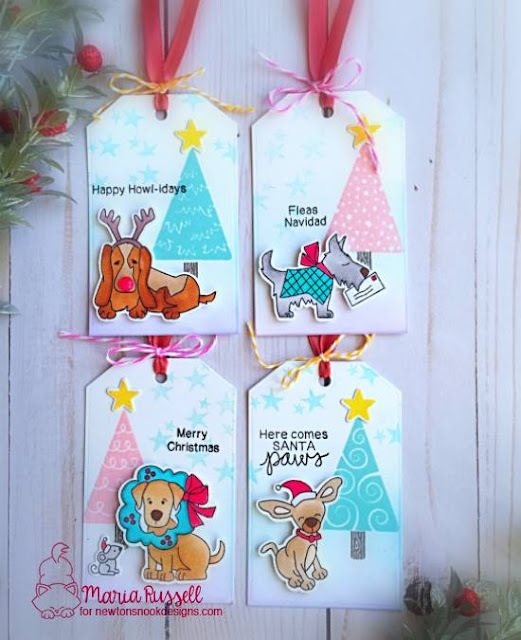 Can't decide if I love the shaker ornament tag or sweet pup tags more! and these tags are gorgeous! Very nice and informative post. Please keep it up. These are fabulous! Great mix of traditional and cute! Wow the tags by Tatiana and Ellen are amazing! All the tags are out of this world today! The tag with the cat (Newton??) peeking out of the box makes the most PURR-fect tag!! :D Cats love boxes and since these tags are on gift packages, the connection is just so fun and natural. 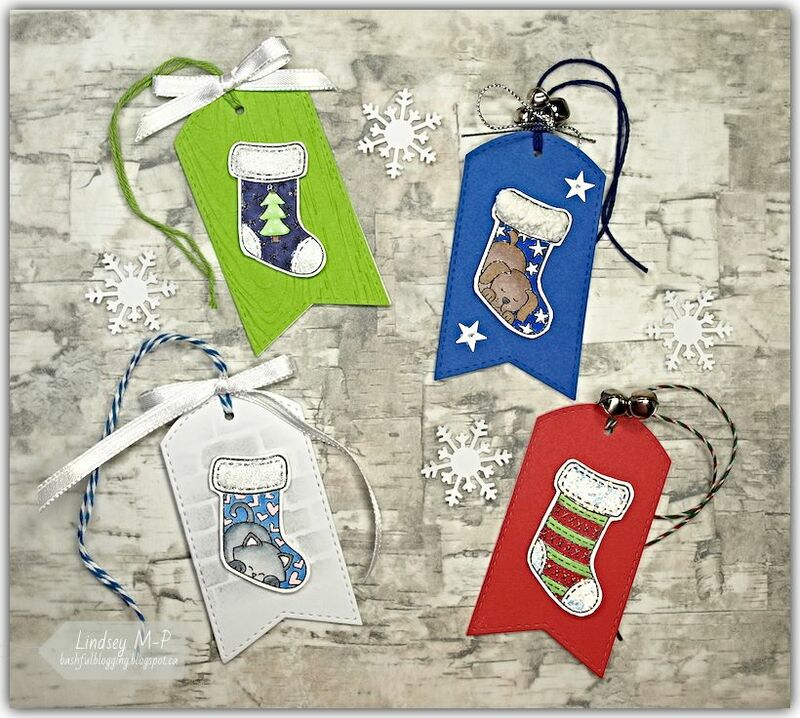 I also love the cute little stockings on some of the tags. Fun tags! Love the shaker ones! I love the shaker ornament/tag design! So many cute tags! I love the ornaments ones and the shaker ones especially! Those little dogs are a hoot! All of these tags are amazing. I love the shaker Christmas ornaments. Zsofia, I love your sweet tags! the sentiment tags are really sweet, I don't know why I don't think of just using sentiments on my tags. Thanks for the awesome inspiration as always! Love the white with the black and white stripe behind, my kinda of tag. 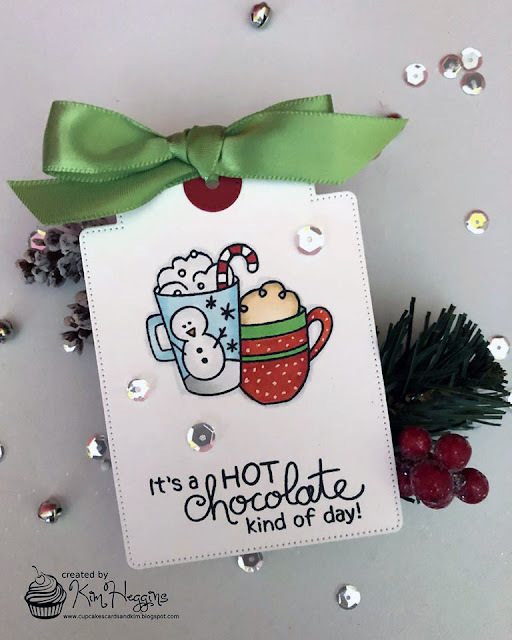 Lots to choose from, but Zsofia's sentiment tags are what captured my attention today! OMG these are wonderful tags! I love the set that is white & red! Such great stamps and designs from everyone! My fav has to be the plaid tho!!! I love those shaker tags and your little snowman scene is adorable. OMG! I love these tags! I'm very into all things "shakers" right now, so I am loving the shaker shaped ornaments! 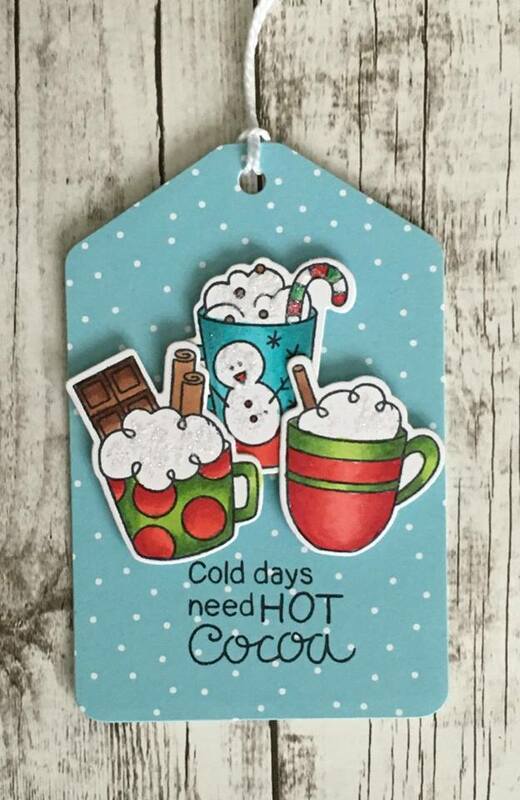 I also love Kim's and Carol's hot chocolate tags. They are too cute! And Maria's pups made me smile. 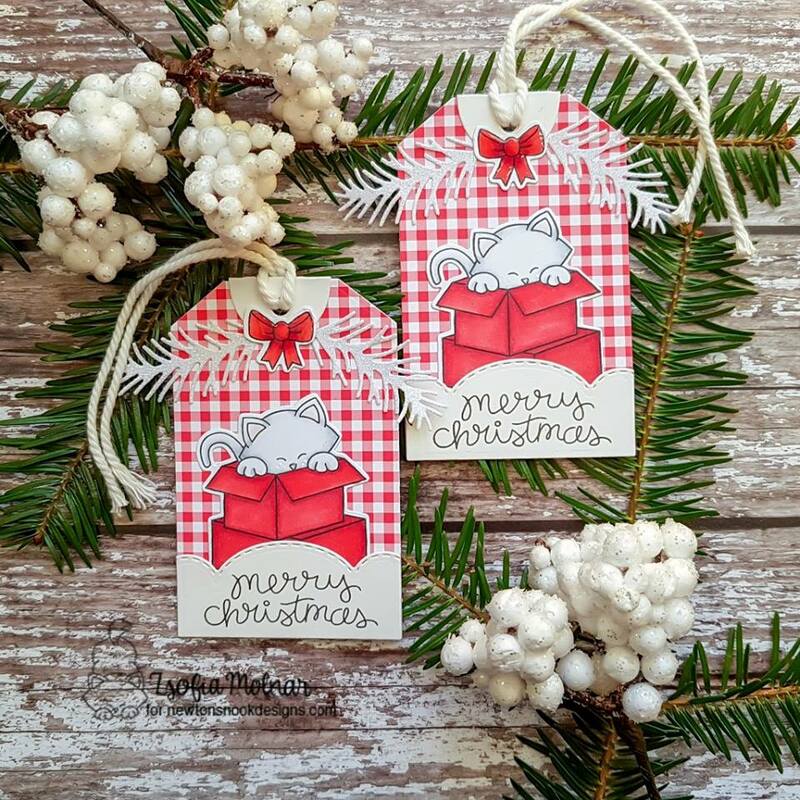 Those ornament tags are so happy!